The Amelia Island Concours is celebrating their 20th Anniversary in a big way starting on Thursday March 12 all the way through Concours Sunday on the 15th. 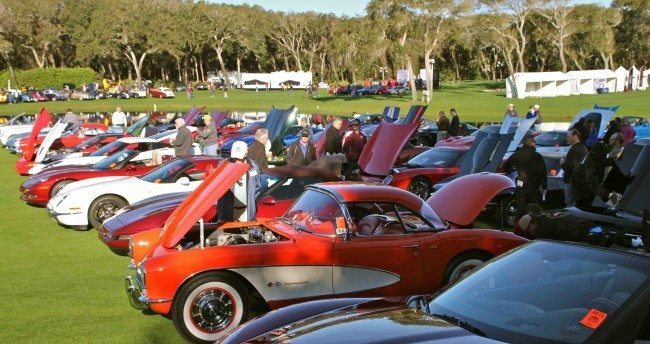 For those of us who attended the initial few events, it is rewarding to see the stewardship of Bill Warner and his crew, and the significant charitable impact the Concours has made in NE Florida. Heacock Classic is proud to be a part of that success by once again sponsoring Saturday’s Cars and Coffee event on the golf course at the Ritz-Carlton. Thursday kicks off with the RM Auctions Preview and the start of an elegant Silent Auction from 3 – 6PM. Friday features the Passport Transport Eight Flags Road Tour, departing from the Ritz-Carlton at 8:30 AM and ending up for lunch in Fernandina Beach. Gooding and Company is just around the corner, offering a full compliment of Italian cars, including a ’61 250 GT, ’63 250 GT Lusso, ’65 275 GTS, and a stunning ’67 275 GTB/4. Don’t miss the Design DNA Seminar and the DuPont Registry Reception at the Airport that evening. Saturday’s Main Event is the Heacock Classic Insurance “Cars and Coffee at the Concours” event from 9 – 1 on the fairways of the Ritz-Carlton. 2015’s event saw about 250 great vehicles gathering for coffee and pastries for all the entrants, and the local car clubs showed up in force. The range of vehicles was wide and deep, touching all styles and eras. There’s no charge to show your car, but pre-registration is required. Saturday afternoon RM kicks off the Amelia Island sale they have held since 1999 with some stunning lots, including a 1931 Alfa Romeo 8C Zagato, a 1967 “Semi-Competition” 427 Shelby Cobra, and a Scaglietti penned 1972 Ferrari Daytona Spider. Saturday evening is capped by the elegant Mercedes-Benz Gala Dinner, which this year, honors the life and automotive career of Sir Stirling Moss. To celebrate two decades of automotive design and competition excellence the Concours committee will reprise the founding Concours of 1996 including original honoree Sir Stirling Moss and a special selection of Stutz automobiles. 2015 marks the 60th anniversary of his record setting victory in the Mille Miglia, his first World Championship Formula 1 victory and the dual World Championships of Mercedes-Benz in the World Sports Car and Formula 1 drivers championships. If you have a Concours worthy collectible you’d like to insure with us, let us show you how we are more than just another collector vehicle insurance company. We want to protect your passion! Click below for an online quote, or give us a call at 800.678.5173.